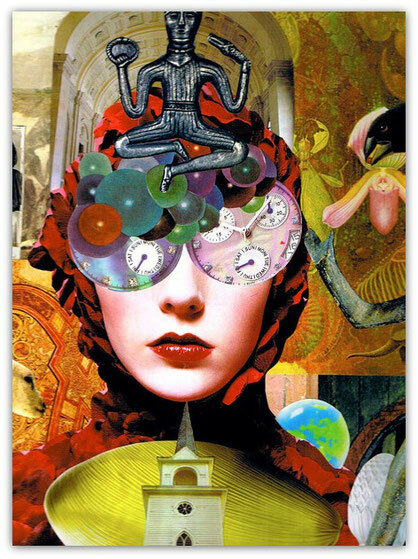 Intuitive collage involves is sitting down with a pile of old magazines and choosing images, textures, and colours without thinking or judging. It is easy to gather an overflowing abundance of images that can be recycled into opulent, personal works of art. Glue down anything that excites or intrigues you - in fresh and spontaneous ways. When I sit down in my studio and start to flip through old magazines, I keep my mind relaxed and my eyes soft. My breath is deep and gentle as I look for anything that catches my eye. I don’t ask myself why I am drawn to images of old wooden doors, a red bird, the carved bust of a king, a hot pink lotus flower. All I know is that I am delighted with what I find. My fingers get sticky with glue and as I lay down the backgrounds and the collage begins to come together like the mysterious pieces of a puzzle. A blackbird drops a seed into a pink flower. Eyes become clocks. A cathedral ceiling evokes the expanded state that I am in. My collage unfolds with a force greater and more generous than I could ever plan for. The patterns and colours are instantly opulent and richly detailed. I find a warm red Celtic scroll, a verdigris fossil. I look for small finishing details, a wing from a bird, a ladybug, a church steeple. Finally, it feels finished and I feel complete, more whole than when I began. I look up at the clock. Where did the last hour go? I put my collage up on the window ledge and I look at it throughout the day. Insights and ideas come to me as I do other things. I communicate with my collages and with the deeper, more mysterious parts of myself. The carved door feels like a possibility. The king’s imperial head feels like strength. Suddenly, I have an answer to something I have been wondering about. I could act with new strength as easily as I could open up a door and walk through it. Yellow orchids seem to bloom and applaud my insight. My life suddenly feels more vivid and rich with possibilities. The next time you pick up a magazine try looking at it with soft, relaxed eyes. What jumps out at you? Is it a word, a colour, a shape? Cut it out, glue it down and then add more images. What does it tell you about yourself? What we notice provides clues to who we really are. There is a true self within all of us that is always waiting to be more profoundly discovered. Anyone can touch into their deeper feelings, insights and desires through spontaneous collage.